Tieing for 2nd place in Senior Céilí Bands competition at Fleadh Cheoil na hÉireann 2017 in Ennis, Co. Clare, the Blackwater Céilí Band from CCÉ, Clogher Valley, Co. Tyrone, play a Hornpipe - “P.J. Moloney’s” (S. Ryan). 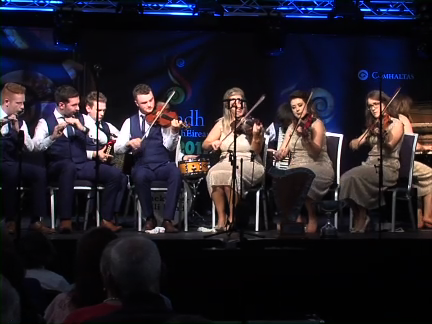 Band members are - Rosie Ferguson, Ursula McAdam, Eugene McKenna and Lydia Warnock on fiddles; James McCaffrey and Michael Coney (flutes), Ryan Hackett (piano accordion); Michael Curran (button accordion); Rachael Masterson (piano) and George McAdam on drums.